If you’ve ever had to lug your laundry bag down five flights of stairs and across three long blocks to the nearest laundromat (and back) you know that having a laundry room–whether it’s a nook in the kitchen, a corner of the basement, or a dedicated room just for cleaning clothes–is a beautiful thing. But you might not be sure exactly sure what you should put in this space. Laundry soap is a given, but what else? What should be stored in the laundry room as opposed to the bedroom or linen closet? And how should all of this stuff be organized? 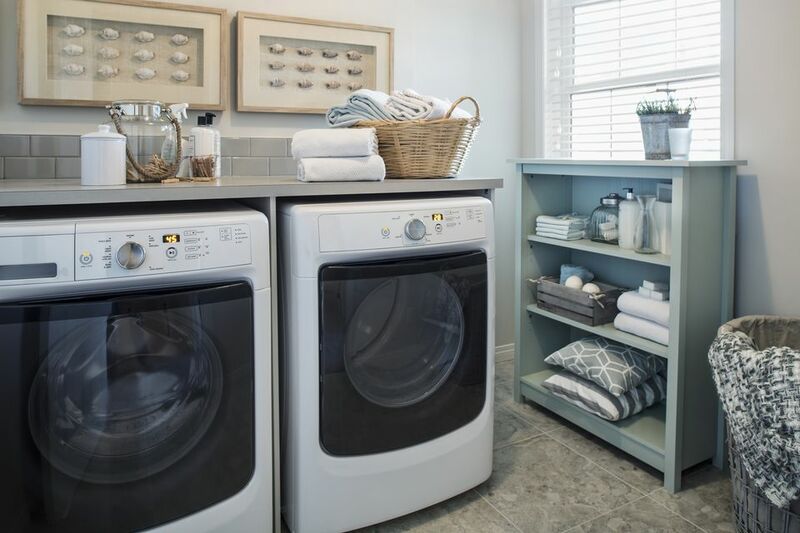 If you’re wondering how best to utilize this space, here are some basic tips on what you should keep in your laundry room and how to organize everything to make washing and drying clothes convenient, easy, and maybe even enjoyable. Keep any products you use for other laundry room tasks, like spray starch for ironing or a sewing kit, if this is the place where you mend torn items. If you like to buy backups of your favorite products, store those extras here too. Keep a stash of extra towels and rags close to your washer and dryer. You’ll probably need them, either for drying items flat or on a rack or mopping up the occasional leak or spill. Don’t forget to create a place in your laundry room for any cleaning supplies you need for the room itself. You don’t want to have to dash to the kitchen or bathroom if you need some hand soap, a roll of paper towels, or a mop or broom. Every laundry room needs a small garbage can (and extra liners) for dryer lint and scraps of packaging. Another little way to make laundry less of a hassle is to keep the manual for your washer and dryer (as well as other appliances you use here, like irons) close at hand. If something starts thumping or blinking alarmingly, you can troubleshoot the problem without running around the house searching for the offending appliance’s information. Once you’ve got the basics, the other things you add to your laundry room will depend on how big the space is and how much time you want to spend in it. If you have a relatively large and attractive laundry room, you’ll obviously be able to use the room for more tasks than you will if your washer and dryer are in a dark, unpleasant basement or narrow hallway. Bins to sort laundry into darks, lights, towels, and so on. You can also set up an area of the room with a clothing rack or rod to hang pieces you’ve ironed, a sewing station with your sewing machine and other supplies, or a comfortable chair for knitting. No matter how much you store in your laundry room, the important thing is to set up your supplies in a manner that’s most convenient for you. This will vary depending on the configuration of your space. A large room can accommodate a large shelving unit for detergent, cleansers, and anything else you need, or you may even be able to install cabinets. A closet-sized nook will have fewer options. As in any space, think about using corners (a triangular shelving unit might fit), doors (a hanging bag, like those meant for shoes, can hold lots of things if you’re creative), and height (add a floating shelf above the washer and dryer). However you organize, put what you use most within easy reach. You probably use detergent every time you turn on the washer, so put that front and center. But if you rarely use bleach, that can go at the back or end of the shelf. To store small items like detergent pods, pour them into a jar or bin. Also consider keeping a laundry room junk drawer, not for useless household clutter, but as a temporary home for coins you find in jeans pockets, buttons that fall off shirts, lone socks and so on. If your laundry room is, well, a room, you’re free to decorate it as you would a bedroom, office, or any other space. The choices are endless, and between paint, furniture, wall art, and storage options, you can fully express your personal style. Even a small laundry room can be inviting. If your washer and dryer are stuck in a corner or hallway, you can still create a pleasant area with a few small touches. A strategically placed curtain can create a door if there is none. Throw rugs and woven mats brighten up a space and give you a soft place to stand. Matching cloth boxes hide plastic and cardboard packaging on open shelves. And a lamp can make all the difference in those dark basement laundry areas where you’re scared to venture after dark. Depending on the layout of your house, your laundry room might be the perfect place to store items that don’t have a “home” anywhere else. If you have a spacious laundry room but lack a traditional hall closet or linen closet, don’t worry about where things are “supposed” to go. Instead, take advantage of that unused laundry room space and stash extra paper goods, cleaning supplies, sheets, towels, and luggage. The laundry room can also be a good spot for recycling bins or bags of clothes you want to donate after you declutter your closet. Even if you’re working with a large space, don’t allow your laundry room to become a dumping ground for clutter. Much like a garage, a laundry room tends to be a spot that collects a lot of non-essential items that don’t really have a storage space. This is especially true for old clothing and linens that you should really donate. If you wash and dry something, and it sits in the laundry room for months, that's a sure sign it’s time to donate it.